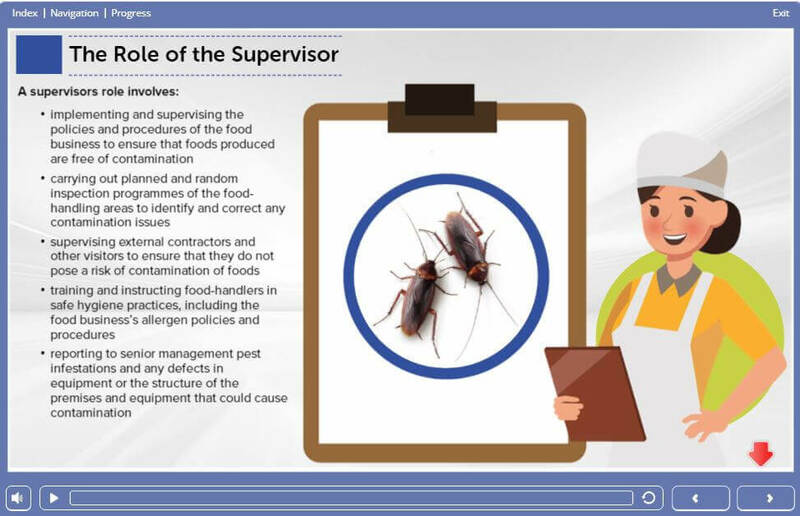 This Level 3 Food Safety Training Course has been designed specifically for supervisors and managers in the food industry, along with other senior staff. The Level 3 course will help those in the catering industry understand their daily responsibilities. A food hygiene level 3 course provides high levels of information covering good food hygiene practices and the legal responsibilities of those who manage others in the handling of food, to ensure that food remains safe to eat. One of the key factors responsible for incidents of food borne illness is the lack of understanding of safe food hygiene practices. 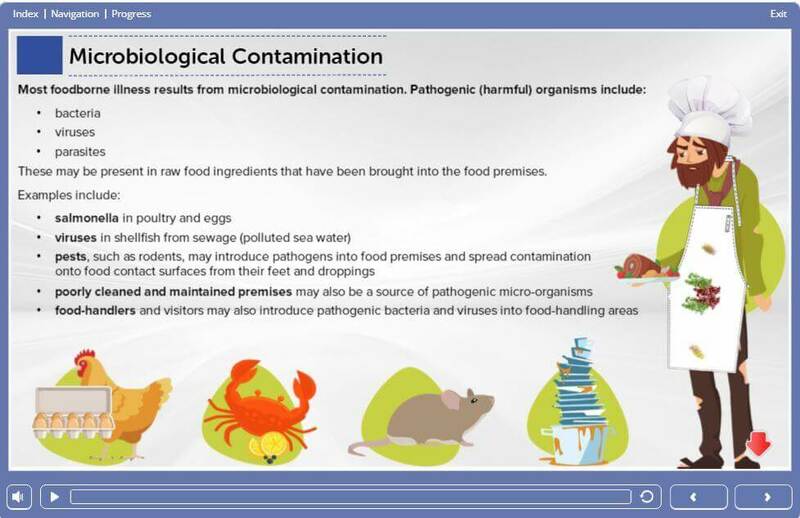 If you put into practice the food safety principles set out in this course, consumers of your products should not become food poisoning statistics. Ready to gain your Accredited City & Guilds Level 3 Food Hygiene Certificate? Who is this food hygiene supervisor course for? This Level 3 Food Hygiene course is suitable for business owners, managers and supervisors in all types of food-handling businesses. An essential part of your role is to understand your legal responsibilities and effectively supervise the implementation of safe and hygienic food practices in your business, ensuring they are followed by all food-handlers. 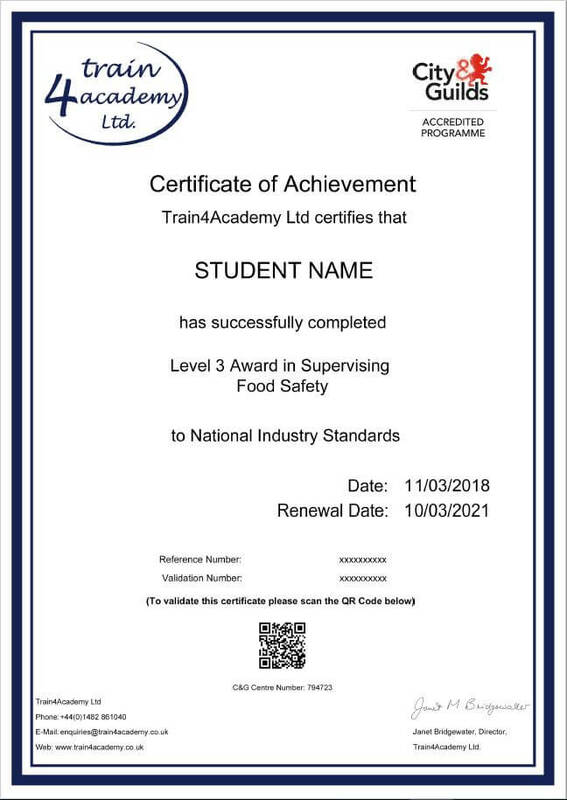 Our Level 3 Food Safety & Hygiene course is Accredited by City & Guilds, allowing us to provide the most up to date and industry recognised course. How long does a Level 3 Food Hygiene Certificate last? A Food Hygiene Certificate does not have an expiry date or run out, however we advise you to refresh your knowledge every 3 years. This ensures you keep up to date with the latest food safety and hygiene legislation. Our Level 3 Food and Hygiene for Supervisors course has been approved by Environmental Health Officers with it's content developed in accordance to their guidelines. This level 3 food hyiene and safety course for supervisors provides 6 - 7 points towards your Continuing Professional Development (CPD). Click on the Level 3 Supervising Food Safety in Catering course screenshots for a larger image. 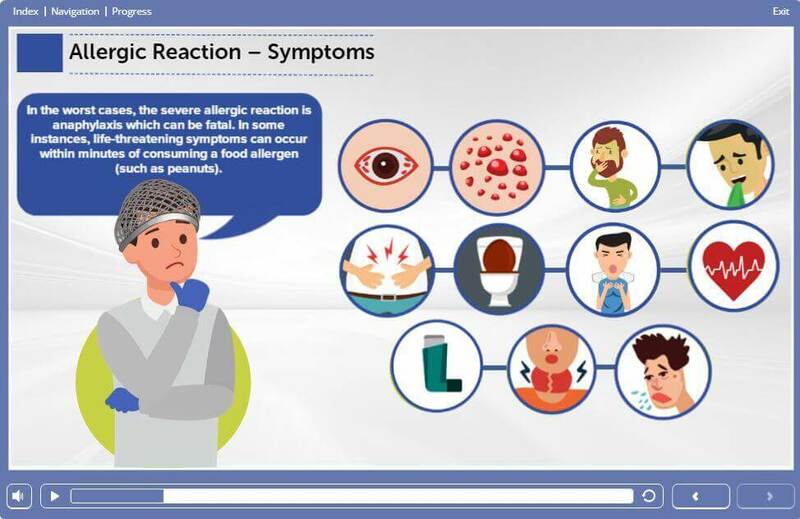 The online assessment for the course consists of 45 multiple choice questions. In order to be successful, candidates must achieve a 75% pass mark (34 or above) to obtain the certificate. The assessment is timed and candidates are given 75 minutes to complete the assessment. If you do happen to fail this course then don't worry! We offer Unlimited FREE resits. Simply contact our support team to reset the course for you. This level 3 food course aims to give you the level of knowledge and understanding you will need to carry out your role effectively to ensure compliance with the relevant regulation (Regulation (EC) No 852/2004), which states that all staff who handles food must be trained to the highest standards by providing the level of detailed knowledge relating to food safety practices and principles. It explains how to promote best practice in the day to day running of the workplace and its importance. This includes the basics of implementing an effective HACCP food safety management system. 1. Introduction to Food Safety & Microbiology Covers food safety principles and factors responsible for incidents of food borne illnesses. 2. Food-safety Hazards & their Control Covers how to identify the different types of food safety hazards, including the four main groups, which are biological, chemical, physical and allergenic. 3. 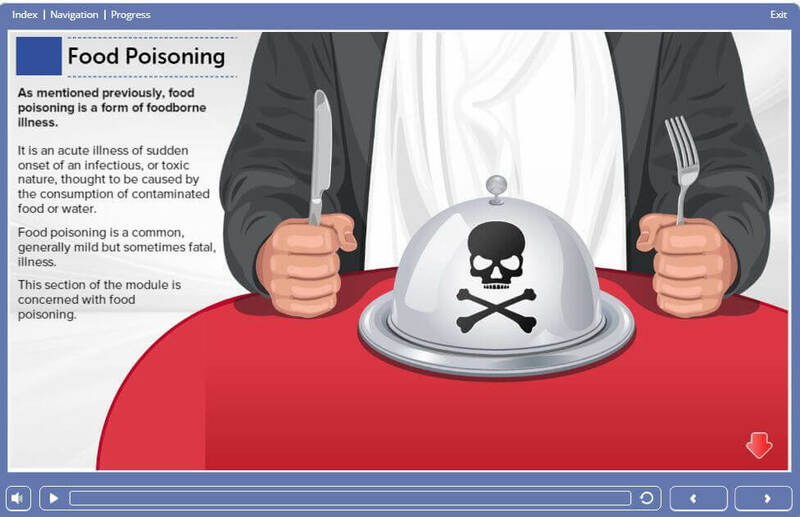 Food Poisoning & Food Borne Illnesses Looks at food poisoning and foodborne illnesses, what factors are responsible for outbreaks, the symptoms and the control measures that can be put in place to minimise the risk of infection. 4. Personal Hygiene Looks at good hygiene practices to help ensure that when handling food, food-handlers do not become a source of contamination. 5. Cleaning & Disinfection Covers how to carry out effective cleaning and disinfection of equipment and facilities while following the relevant health and safety precautions to ensure the safe use of chemicals. 6. Waste Control Looks at the types of waste in a food environment. 7. Pests & their Control Looks at signs of pest infestation, how pests can become food safety hazards and the actions that should be taken where pest infestations exist by using good housekeeping techniques. 8. Food Premises & Food Equipment. Before commercial food-handling operations can begin, the intended premises must be suitable and approved by the enforcement authority (environmental health). 9. Food Storage & Temperature Control Covers the importance of following best hygiene practices and guidelines relating to the safe storage, transportation and temperature control of different types of foods to ensure food remains safe for consumption. 10. Food Packaging, Labelling & Traceability Designed to help you to under-stand how and why we package and label food to keep food safe for the consumer. 11.Food Preservation Looks at how yeasts, moulds and bacteria can cause the decomposition and spoilage of foods, which can make food unfit for human consumption. 12. Food Safety Management Looks at the 7 principles of HACCP (Hazard Analysis Critical Control Point) as a food safety management system and the benefits of implementing it effectively. 13. Food Hygiene Legislation Designed to give you a good understanding of the principal food hygiene legislation that applies to the UK and it relationship to European Community law. If you're looking to train a team of 10 or more than we are happy to provide a range discounts.